Sir E. W. Greene, Bart. 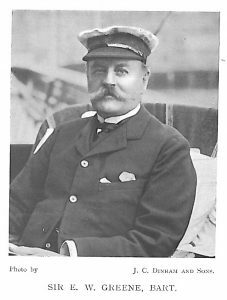 Was born in 1842, and from early youth has been devoted to sailing. He started his yachting experiences in 1864 with a 15-ton cutter, and he afterwards bought the 9-tonner Grebe for use on the Broads and for sea-fishing. In 1891 he bought the s.y. Opal. She was renamed Wild Wave, and subsequently sold to Mr. J. J. Colman, of Norwich. Sir Walter then commissioned Messrs. Day, Summers and Co. to build the Sunflower, 295-ton screw schooner, and this boat was largely used for cruising purposes. He now owns the fine s.y. Agatha, 460 tons. Clubs: Royal Yacht Squadron, Norfolk and Suffolk. Residence: Nether Hall, Bury St. Edmunds. 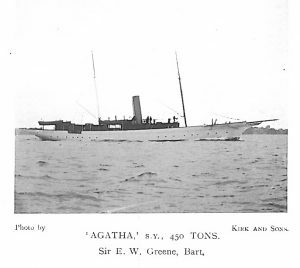 Agatha, S. Y., 450 tons. Sir E. W. Greene, Bart.